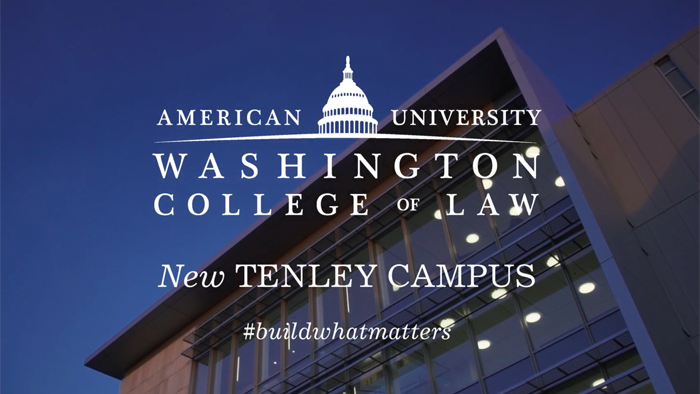 Thanks so much for your interest in American University Washington College of Law’s new Tenley Campus. We are very excited about what this new campus means for our students, faculty and staff and the entire legal community here in Washington D.C. and around the world. If you would like further information, or would like to schedule an interview, please contact our public relations team. As part of the celebration weekend for the new campus, on Saturday, Feb. 13, American Unviersity Washington College of Law hosted a breakfast with guest speaker Dr. Jim Yong Kim, president of The World Bank Group. After the breakfast, over a dozen discussion groups on relevant local, national, and international topics by leaders in their fields took place, offering free Continuing Legal Education to participants. During the Tenley ribbon-cutting festivities Feb. 12-13, we asked students, faculty, alumni and friends to share their excitement for our new campus with the hashtag #buildwhatmatters – and they did just that! We’ve compiled some of our favorite moments from our celebration captured on social media. Check it out! On February 12, 2016, American University Washington College of Law welcomed hundreds of alumni, students, city officials, and members of the law school and AU communities to the Ribbon Cutting Celebration Weekend for its new Tenley Campus. Watch our highlights video from the ceremony. From Feb. 12-13, American University Washington College of Law welcomed hundreds of alumni, students, city officials, and members of the law school and AU communities to be a part of its ribbon cutting celebration weekend for the new Tenley Campus, just one block from the Tenleytown/AU Metro. As a gracious welcome to the neighborhood, the local Whole Foods Market sponsored a lunch between the discussion group sessions. U.S. Supreme Court Associate Justice Ruth Bader Ginsburg and D.C. Mayor Muriel Bowser will join AU leadership, distinguished alumni, and the SBA President in a formal ceremony to officially open the new American University Washington College of Law Tenley Campus Feb. 12,2016.